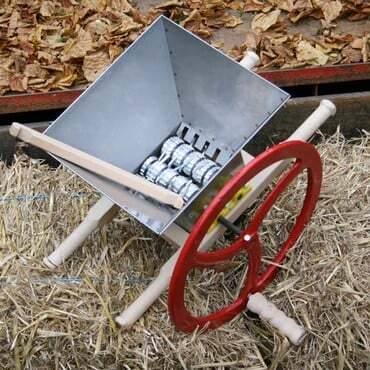 A Fruit Press and Fruit Crusher are invaluable if you're faced with an orchard full of apples and pears that you want to turn into fresh fruit juice or make into cider. Even if you don't have an orchard many of you have more than one fruit tree in the garden and on a good year they can produce more apples and pears than your family can comfortably eat. 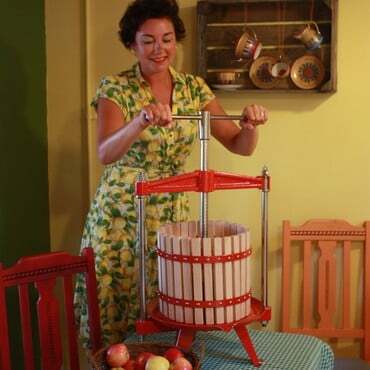 You could, ofcourse store them, but how about using an apple press to make fruit juice instead? Fruit pressing and fruit crushing is a process rich in history, with the production of apple juice and cider stretching way back to Norman times. But things have moved on a bit since then and now pressing your own fruit at home could not be easier. You can even use up windfalls and blemished fruit too to make your own sparkling fresh juice for drinking, freezing, making syrups, ices and jellies or use it to make cider or wine. 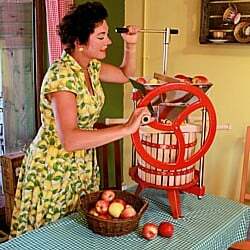 You won't believe how quickly and easily the apple press - along with a helping hand from the fruit crusher - turn apples or pears into juice! 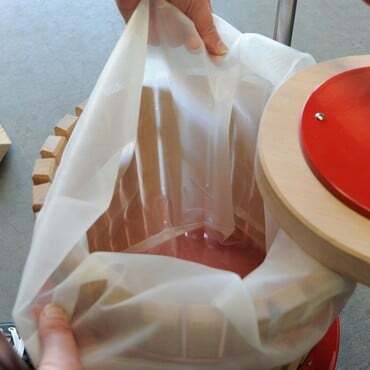 Simply fill the fruit press with your crushed fruit and turn the handle to force the fresh, pure juice through the beech staves. Straining/filter bags are available as an optional extra. Useful for filtering out pips, seeds and other plant material you don't want getting into the freshly pressed fruit juice. It is possible to experiment with lots of different varieties of fruit to make your own unique flavoured juices and cordials. The compacted fruit pulp created when pressing need not be wasted either as it can be used either on your compost heap or fed to chickens if you have them. After cutting 30 apples into quarters and putting them straight in the press, we collected 350ml of juice. Running the same amount of quartered apples through a crusher first produced a whopping 1600ml of juice - that is a staggering increase of 357% of fresh juice! If you have a glut of Fruit and want to produce up to 8 litres in one single operation then a 20 Litre Cross-Beam Press might be the best choice for you. 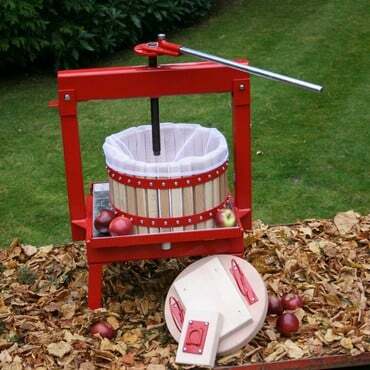 Each operation can press approximately 18Kg/40lbs of milled apples and produce around 8 ltrs/14 pints of refreshing juice.